Owners of Canon crop sensor DSLRs have been waiting a long, long time for Canon to come out with an updated APS-C sensor. The 18-megapixel CMOS sensor they’ve been using for the past three years is getting pretty far behind in terms of image quality so there was a lot of excitement when Canon announced the EOS 70D (hands-on 70D intro article & video) with a brand new 20-megapixel APS-C CMOS sensor. Unfortunately, if you were waiting for better image quality, you’re not going to get it with this sensor – not for RAW images, anyway. I don’t want to get too far off track here – this is an image quality article, after all. But the new sensor in the Canon EOS 70D wasn’t really designed for improved image quality. It’s Canon’s first sensor featuring Dual Pixel AF, which splits each pixel in half for phase detect auto focus in live view and video (the two halves are used together as one pixel for image capture) – it’s about auto focus performance, not image quality. The good news is, in spite of the 70D pixels being split in half, Canon has maintained the same image quality we had in the previous 18-megapixel APS-C CMOS sensor. I’ve shot a bunch of subjects with the 70D, including people, landscapes, and architecture – and my photos look great. The question is, do they look better than what I could get with a Canon EOS Rebel T5i / 700D, EOS 60D, or the EOS 7D? 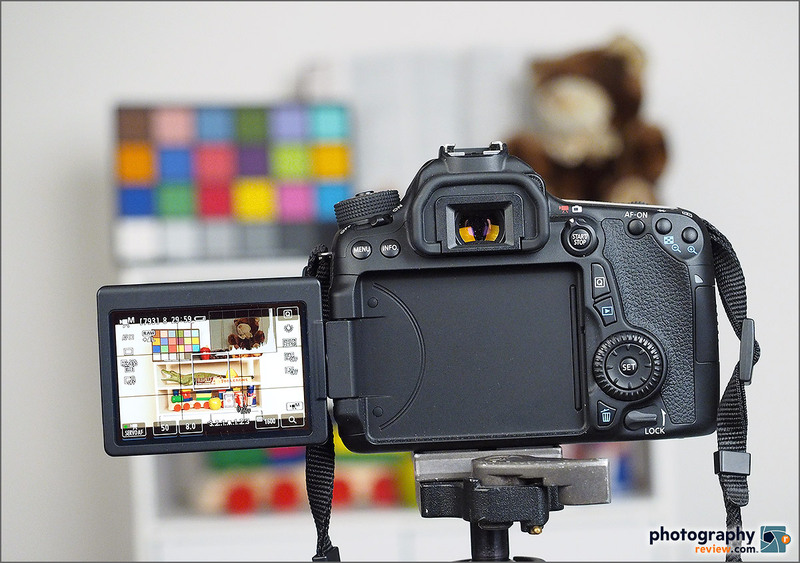 I did a careful comparison between RAW studio tests from the T4i / 650D and the EOS 70D, and aside from a slight difference in size due to the 70D’s increased resolution, the sample photos look pretty much exactly the same. That’s too bad because I think Nikon, Pentax and Sony APS-C cameras are all producing RAW Images that are about one stop better than the Canon APS-C sensor. It’s not like the EOS 70D has bad image quality, though. It’s very good. You just can’t push it quite as hard as the competition – especially not the Nikon D7100, the reigning king of APS-C sensor DSLRs (read our Nikon D7100 review). For those of you who shoot JPEG and / or video, Canon says that the new DIGIC 5+ image processing provides significant improvement in JPEG and video quality. The EOS 70D’s JPEGs do look better to me. I’m honestly not a fan of most in-camera JPEG processing and they’re still on the soft, over-processed side for my taste. 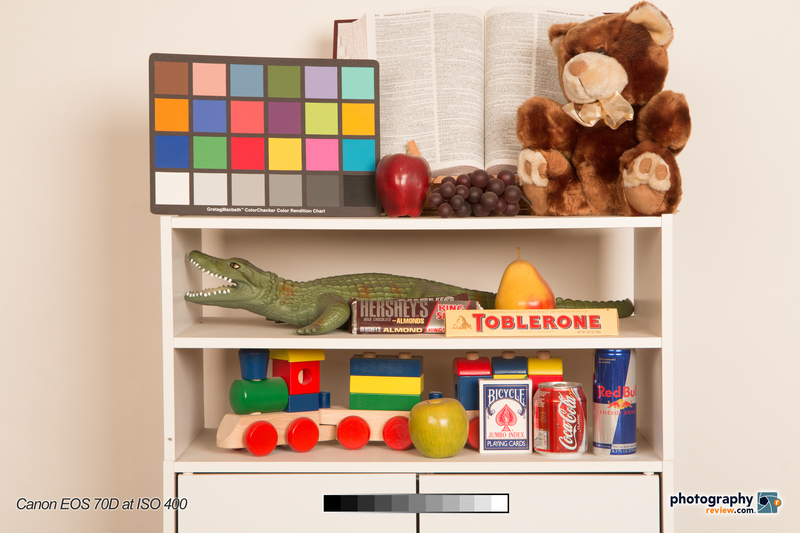 However, the EOS 70D studio test JPEGs do look more refined than the T4i / 650D tests, with more subtle details, better color, and a bit more sharpness. The Canon EOS 70D sample photos below were shot RAW in aperture priority mode with the Canon EF-S 17-55mm f/2.8 IS lens at f/8 with white balance set to the tungsten preset. 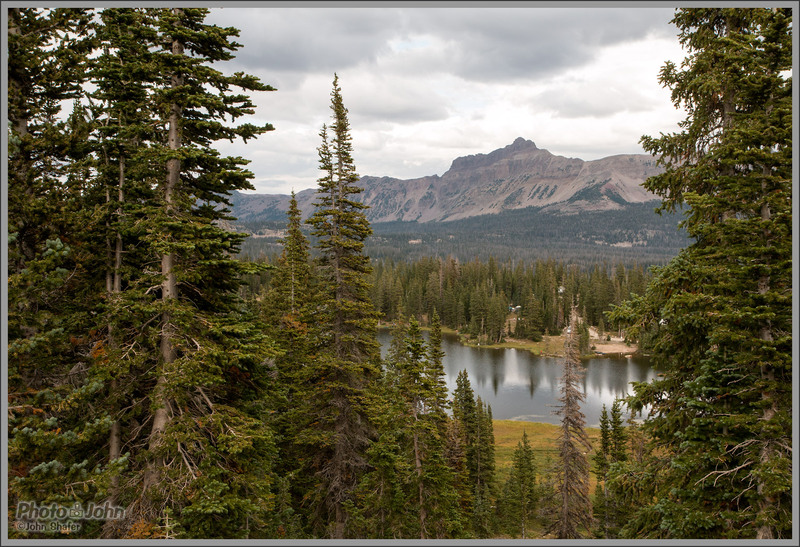 The RAW files were converted to 16-bit TIFFs with Lightroom 5.2 RC and the graybar, logo and text were added in Photoshop before the final files were saved as maximum quality JPEGs. No sharpening, noise reduction or any other kind of adjustment was made. Since Lightroom 5.2 RC is “Release Candidate” software with “preliminary support” for the EOS 70D, we may redo these samples after the final version of LR 5.2 is out (that should be next week). However, I wouldn’t expect any dramatic improvements. When I visited Canon headquarters in NY a few weeks ago, they flat out told me not to expect any real changes in RAW quality from the EOS 70D. Warning: these files are big – be patient while they download. We welcome your comments and user reviews. If you own the Canon EOS 70D, please click on the link below to go to the user review page and write your own review.